Today, Maxine is going to take you step by step to create an adorable autumn parcel for a loved one that will definitely come in handy for those cosy nights in! 1.Begin by downloading and printing off your free template. Following the measurements on your printable, cut and score where shown on a sheet of Dovecraft A4 white card stock. 2.Adhere the sides together to create the box using Dovecraft Perma Fix Tape. 3.Cut two, 15cm x 6.5cm pieces from the leaf paper within your free download. Adhere them to the front and back of your box with Dovecraft Perma Fix tape. 4.Cut two smaller coordinating pieces of paper from your free download to cover the sides. 5.Cut out the fox tag and layer it on to a patterned sheet from your download. Adhere it with Dovecraft Perma Fix Tape to the front of your box, in the centre. 6.Follow your template measurements to create the handle out of Dovecraft white card stock. Adhere a piece of complementing paper from your download to one side of your handle. Stick your handle to the inside of your box, on both sides with Dovecraft Perma Fix Tape. 7.Cut out a tag shape on a piece of Dovecraft white card stock, cover with your chosen paper design, punch a hole at the top and thread a length of Dovecraft twine through it. 8. Decorate your tag by cutting out the ‘With Love’ sentiment from the tags sheet and adhering it to the centre with 3D foam pads. Attach your tag to your gift. 9.Make a wrap for your tea bags by cutting a strip of Dovecraft white card stock, layering a patterned sheet on top, wrapping it around your tea bags and securing it with Dovecraft Perma Fix tape. Stick the ‘Autumn Wishes’ sentiment on top to finish. This little parcel of goodies will make a wonderful treat for a loved one for their birthday or as a sweet gesture! You could also make a nature inspired card by layering the autumn papers on your card blank. Then, die cutting a selection of leaves from the First Edition Foliage dies set and the happy birthday sentiment from the Dovecraft dies collection. Adhere these with Dovecraft Perma Fix tape and 3D foam pads to your card. Maxine has used the bunny illustration as the main topper because who can resist this fuzzy creature? Alternatively, you could craft a mini album by creating pages with extra space for a hidden tags and layering the pages with your chosen paper designs! This would make a lovely gift to remind a friend of all the fun times you’ve had. 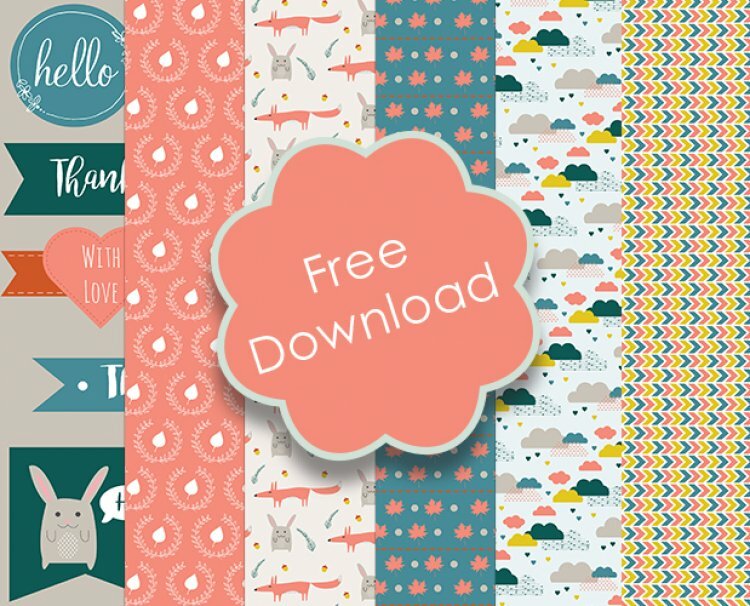 We can’t wait to see how you use this free paper download so remember to upload them to the project gallery and to #Trimcraft when uploading to social media.